The original building was purchased in 1969/70 and with generous donation refurbished into Southampton’s second Gurdwara. 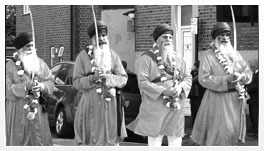 In 1979 the Gurdwara adopted its first constitution. Recently the Gurdwara has undergone further refurbishment. As a result of this, the front of the building was extended to increase the size of the Diwan Hall and the placement of Domes on the roof above the Palki and to the sides. The Constitution was amended to allow the co-opting of professional, influential members who would be able contribute significantly to management of the Gurdwara with their specialist knowledge. These lists are only a summary. A full list can be obtained by contacting the Gurdwara.